The baseball hall of famer and congressional medal of freedom winner Willie Mays shares inspirational life stories and lessons. “I was very lucky when I was a child. My family took care of me and made sure I was in early at night. I didn’t get in trouble. My father made sure that I didn’t do the wrong thing. I’ve always had a special place in my heart for children and their well-being, and John Shea and I got the idea that we should do something for the kids and the fathers and the mothers, and that’s why this book is being published. We want to reach out to all generations and backgrounds. 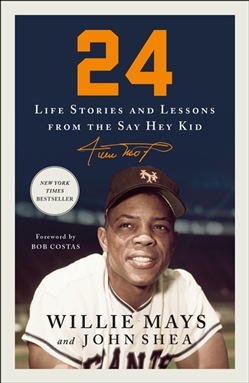 Hopefully, these stories and lessons will inspire people in a positive way.” —Willie Mays “It’s because of giants like Willie, that someone like me could even think about running for President.” —President Barack Obama 24: Life Stories and Lessons from the Say Hey Kid, co-authored with John Shea and told in Mr. Mays’s voice, is full of poignant and timeless stories and reflections from Mr. Mays that helped him become the man he is today, as well as stories from great players of yesteryear who played major roles in his life. Mr. Mays’s Hall of Fame career only begins to tell the story of the impact this American hero has had on generations of people in the U.S. and worldwide. At a time when the color barrier in Major League Baseball had just been broken by Jackie Robinson, Mr. Mays triumphed against still-pervasive bigotry, not just with his enormous talents on the field, but by also adhering to the type of life plan and philosophy that he lays out in this important new book. 24: Life Stories and Lessons from the Say Hey Kid is presented in 24 chapters (signifying his legendary uniform number), showing Mr. Mays’s deep and tremendous influence on people in and out of baseball, as well as what has driven him to achieve greatness, including the impact his father had on his life. It is destined to be a book that everyone will turn to for guidance, life game-planning, and amazing and wonderful stories from the greatest all-around player to ever play baseball. Acquista 24 in Epub: dopo aver letto l’ebook 24 di Shea John, Willie Mays ti invitiamo a lasciarci una Recensione qui sotto: sarà utile agli utenti che non abbiano ancora letto questo libro e che vogliano avere delle opinioni altrui. L’opinione su di un libro è molto soggettiva e per questo leggere eventuali recensioni negative non ci dovrà frenare dall’acquisto, anzi dovrà spingerci ad acquistare il libro in fretta per poter dire la nostra ed eventualmente smentire quanto commentato da altri, contribuendo ad arricchire più possibile i commenti e dare sempre più spunti di confronto al pubblico online.